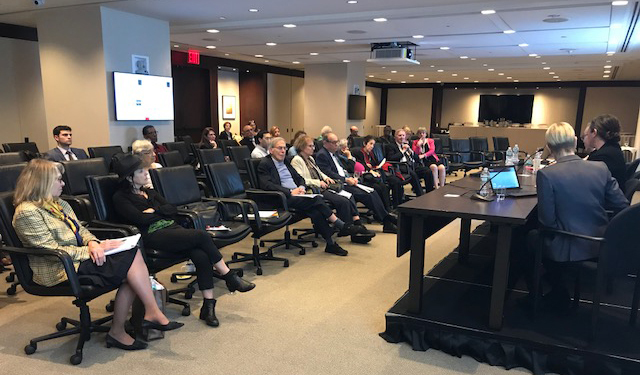 JALBCA and Simpson Thacher & Bartlett LLP sponsored a program on October 24, 2017 focusing on immunotherapy in cancer care. Immunotherapy, also known as immune cell therapy, constitutes a range of treatments that harness a patient’s own immune system to target cancer. Simpson Thacher & Bartlett partner and breast cancer survivor, Roy Reardon, opened the program by noting the anxiety felt by most cancer survivors who worry that a twinge or illness is a recurrence of the cancer. In the past, Mr. Reardon remarked that he never heard the word “cure” used in reference to the disease. This changed for him after he watched a “60 Minutes” program where the word “cure” was used. The program prompted him to pursue the JALBCA program on immunotherapy and its prospects for cancer patients. Moderated by Hon. 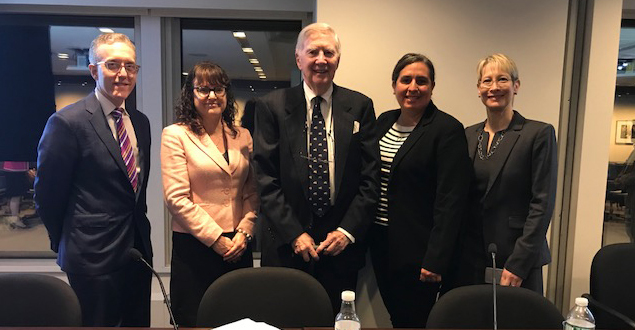 Melissa A. Crane, Acting Justice of the Supreme Court (New York County), the evening program featured three impressive speakers – Jedd D. Wolchok, M.D., Ph.D. (Chief, Melanoma & Immunotherapeutics Service, Memorial Sloan Kettering Cancer Center), Stephanie L. Goff, M.D. (Surgical Oncologist, National Cancer Institute at NIH), and Mora Dickler, M.D. (Medical Oncologist, Memorial Sloan Kettering Cancer Center). Dr. Wolchok outlined the strategies used to treat melanoma which are now being used for other cancers. The conventional strategies – surgery, chemotherapy, radiation, hormonal products (for breast cancer), targeted pathway inhibition (a finely tuned version of chemotherapy) – all interfere with cancer cell division and proliferation. Immunotherapy is different. It seeks to use the body’s immune system to fight the disease. While words like “breakthrough” are used, the concept that a patient’s own immune system could be used against cancer has been around for more than 120 years. At the turn of the 20th Century, Dr. William Coley, a surgeon, observed that his metastatic cancer patients who developed post-operative infections lived longer. He hypothesized that the patients’ intrinsic defense system that had been mobilized against the infectious germ could also be mobilized against the cancer, and he injected their tumors with heat-killed streptococcus cells. After the 1920’s and 1930’s, however, the approach was considered quackery and disappeared. The first new proof that immunotherapy might be effective arose from Dr. Steve Rosenberg at NIH in 1985. He used interleukin-2, or IL-2, a protein made by the body that spurs T-cells to proliferate, to treat melanoma and kidney cancer. The treatment does not injure the cancer cell but expands a group of cells and organs that make up the immune system. The use of high dose IL-2 obtained complete responses in some people (less than 10%). Dr. Rosenberg found that if the patient did not succumb to the cancer within two years, the period at which the response to IL-2 goes flat, the patient was cured. T-cells have two inhibitor receptors – CTLA-4 and PD-1 (programmed death molecule no. 1). In order to keep the immune system’s T-cells “active”, researchers have focused on CTLA-4 and PD-1 pathways. Cancer cells put an emergency brake or checkpoint on the immune molecule that is targeting them, using these two pathways. An antibody, ipilimumab, developed by Jim P. Allison, is used to block the protein CTLA-4. The CD-28 receptor is the accelerator on the T-cell. When ipilimumab was tested on melanoma, 20% of the patients lived up to five years. There are approximately five medicines and 20 in development to block the PD-1 pathway. Presently, doctors are combining CTLA-4 and PD-1 treatments, such as ipilimumab and nivolumab, and seeing a regression in more than 50% of melanoma patients. An international study showed that the combination caused a regression in 58% of the patients. The medications cause side effects since they mimic autoimmune disease. However, the side effects can be controlled. Dr. Wolchok then addressed the issue of whether genomics underlies the differential response to drugs from one type of cancer to another. He indicated that melanoma has one of the highest loads of genomic burden, i.e., an accumulation of genetic damage. The greater the genetic damage, the greater the difference in appearance of the cell from a normal cell of its type. Researchers believe the more distinctive the cell is from its norm, the more likely the medicine will recognize the cell as foreign and the more likely the cancer cell will respond to the antibodies. Some cancers are heavily mutated as, for example, because of tobacco exposure (e.g., head-and-neck, esophageal, bladder and lung cancers). The mutational load correlates with clinical outcomes. Dr. Goff focused on immunotherapy. Lymphocytes, small blood cells that are part of the immune system, were recognized in 1968. There are two main types of lymphocytes – B-cells and T-cells. Dr. Goff began by noting three techniques: (1) non-specific stimulation (use of cytokines; checkpoint blockers such as ipilimumab); (2) active immunization (cancer vaccines); and (3) the passive transfer of activated cells, called “adoptive immunotherapy”. She then described the use of tumor-infiltrating lymphocytes (TIL). The surgeon removes the tumor, which is sent to the lab to be minced into pieces and then put in a plate with T-cell growth factor. Populations of lymphocytes grow from this and are tested against the patient’s tumor cells. Researchers then remove the cells that recognize the patient’s tumor cells and grow them. Chemotherapy is given to knock out the patient’s immune system, and the patient is infused with billions of TILs. This is a one-time treatment. TILs can pass the blood brain barriers. In melanoma, TILs can eliminate the last cancer cell as they are recognizing a group of antigens shared with the cancer cell. In one trial, 46 patients were treated and had a complete response, although two had recurrences within the first two years. The remaining patients are fine after 10 years. Axi-cel was developed in collaboration with NCI, whereby NCI first developed an experimental immunotherapy called CAR-T, for “chimeric antigen receptor” therapy, and transferred the technology to develop the drug to Kite. The protein on the cancer cell to which the drug binds – the target – is an antigen. In August 2017, the FDA approved another gene-based immunocellular therapy, Kymriah, made by Novartis AG, for a form of leukemia. Kymriah also is a CAR-T therapy. Dr. Dickler, a medical oncologist, spoke about “Breast Cancer in 2017- Immunotherapy and Beyond”. Breast cancer, she noted, is the most common cancer in women and death rates from this disease are declining. It is not one disease, as previously thought. The two major types are: invasive ductal carcinoma (arising from breast ducts) and invasive lobular carcinoma (arising from breast lobules). They currently are treated in the same way, but we do not know if they should be treated differently. These two types of breast cancer have different survival rates based on the breast cancer subtype (estrogen receptor +, HER2+, and triple negative breast cancer), and different relapse times. Hormone positive breast cancer is more indolent. Triple negative breast cancer has a high mutational burden so the hope is that it would be more responsive to checkpoint inhibitors, i.e., immunotherapy. Dr. Dickler also discussed the results of an American Society of Clinical Oncology study of pembrolizumab. Two cohorts of patients were studied – those previously treated with chemotherapy and those not previously treated. Of those previously treated, 4.7 – 4.8% saw shrinkage of their tumors. Of those not pre-treated, 23.1% had a response to pembrolizumab. A question-and-answer period followed. The panelists distinguished between solid tumors (e.g., breast cancer; melanoma) and liquid tumors (e.g., leukemia; lymphoma). The audience also learned more about the NIH clinical TIL trial – 80% of the participating women were self-referred, and it can take four to five months to find the T-cells to recognize the cancer cell mutations. Somatic random mutations (genetic alterations to a cell that occur in the course of cell division) happen later in the process, while truncal mutations (mutations found in all tumors) occur early in the process and, therefore, can be targeted earlier. Dr. Goff spoke to the case of Judy Perkus, a case widely reported upon in the press. Dr. Goff was involved in this study. Ms. Perkus had been diagnosed with DCIS in 2003. She relapsed in 2013 with invasive, metastatic breast cancer. No treatment worked, and in August 2015, Dr. Goff operated on her, removing some tumor. In December, the doctors found some lymphocytes that worked on the tumor. When sequenced, they found 71 mutations and two places recognized by lymphocytes. Ms. Perkus was treated, and 14 months later, there was no evidence of disease. She is still O.K. 22 months later. However, Dr. Goff had started this therapy on eight breast cancer patients. It takes four to five months to grow the lymphocytes and test them. No lymphocytes that worked were found in three of the patients. Lymphocytes were found in a fourth patient but she died before she could be treated. Three patients were treated. Only Ms. Perkus responded. The panelists told the audience that it is too early to understand the side effects of immunotherapy, e.g., diabetes and arthritis could occur later while colitis could occur earlier. And, while rare, some patients have died from immunotherapy so it is not without risk. If someone has a prior immune system disorder, they likely would be excluded from a clinical trial. Also, when questioned about what can be expected if a patient started, then stopped, then resumed immunotherapy, the panelists indicated that sometimes the drugs work better the second time but sometimes they do not work the second time, which seems to occur in a minority of patients. ¹ Thomas M. Burton, “Immunotherapy Treatments for Cancer Gain Momentum”, Wall Street J., Oct. 13, 2017, B3. ³ Andrew Pollack, “Setting the Body’s ‘Serial Killers’ Loose on Cancer”, New York Times, Aug. 1, 2016, available at https://nyti.ms/2aHTmvU. Claire P. Gutekunst, Esq. joined JALBCA as its new, full-time Executive Director in November 2017. As Executive Director, Claire advises JALBCA’s leadership on its strategic direction, manages JALBCA’s day-to-day operations and assists with JALBCA’s fundraising, grant-making and educational efforts. Claire was the President of the 72,000-member New York State Bar Association (NYSBA) in 2016-2017, having served as President-Elect in 2015-2016. Her signature presidential initiative was a joint Domestic Violence Initiative with the Women’s Bar Association of the State of New York (WBASNY). Claire was a commercial litigator for nearly 30 years at Proskauer. She then served as Special Master for the New York City Asbestos Litigation and as an independent mediator and arbitrator. 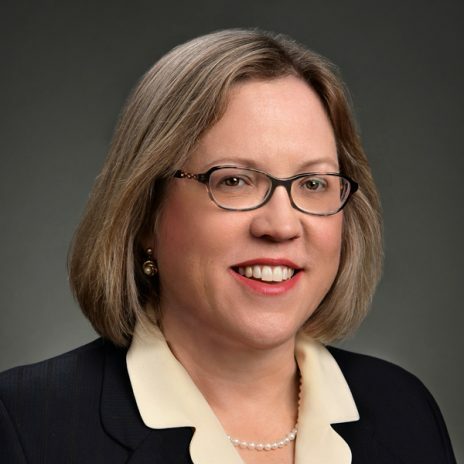 Claire has held many other leadership positions at NYSBA (including Vice President and the first woman Treasurer) and has been a member of the ADR and Arbitration Committees of the New York City Bar Association and the ADR Committee of the Westchester County Bar Association, as well as a long-time member of WBASNY. She is a member of the ABA House of Delegates. For many years, Claire was the chair of the Advisory Council of the Academy of Women Leaders of the YWCA of New York City. Claire lives with her husband in Yonkers, New York. They have two grown sons. The Bronx Women’s Bar Association sponsored a JALBCA luncheon on Wednesday, October 25, 2017, featuring two keynote speakers: Renee Scott (Senior Court Reporter, Bronx County Supreme Court) and Nidhi Sahgal, M.D., F.A.C.S., a specialist in breast surgery and breast diseases. The Rockland County Women’s Bar Association, The Rockland County Center for Safety and Change and JALBCA co-sponsored a lunch-and-learn event on breast cancer awareness on October 18, 2017. The guest speaker was Mary Solomon, Project Renewal, Scan Van Director. An annual breakfast for breast cancer awareness month was sponsored by JALBCA, The Staten Island Women’s Bar Association, the NYS Judicial Committee on Women in the Courts and the Staten Island Gender Fairness Committee. The event took place on Thursday, October 26, 2017. The Westchester Women’s Bar Association and JALBCA sponsored a program on “Breast Cancer Awareness,” including the topics “Breast Health; Early Signs of Disease; Risk Factors; Treatment Options,” on September 12, 2017. Hon. Sondra Miller, a JALBCA co-founder and former Co-President, introduced the program. The guest speakers were Mary Solomon, Project Renewal, Scan Van Director, and Alisan B. Goldfarb, M.D., Breast Surgeon. TOPIC: Are Vaccines the Future of Cancer Treatment? The Wall Street Journal, on December 25, 2017, reported on an off-patent cancer drug whose price was raised significantly. The article, “Cancer Drug Price Rises 1,400% With No Generic to Challenge It”, described how, since 2013, the price in the U.S. of the 40-year-old, off-patent cancer drug Lomustine has risen 1,400%, putting the life-extending medicine out of financial reach for some patients. This is a drug used to treat brain tumors and Hodgkin Lymphoma. It was marketed under the brand name CeeNU by Bristol-Myers Squibb Co., which charged about $50 a capsule for the highest dose. Bristol-Myers sold it in 2013 to NextSource Biotechnology LLC, a Miami start-up, which re-branded the drug as Gleostine. The same capsule reportedly now costs about $768, after nine price increases by NextSource (which supplies the drug by arrangement with its new owner, manufacturer CordenPharma). Lomustine has no generic competition, which raises the issue of market power, as with other drugs for which there are no generic counterparts. Generic drug makers carefully select which drugs to make after consideration of high entry costs, time commitments to obtain regulatory approval and dedicated manufacturing capability, the patient populations, and whether the drug will generate enough revenue to justify the investment. JALBCA addressed the topic of drug pricing at its 2016 Annual Symposium. A focus of the Symposium was the December 2016 report of The Special Committee on Aging of the U.S. Senate on abusive pricing in the pharmaceutical industry. The Special Committee was chaired by Sen. Susan M. Collins (R-ME) and ranking member Sen. Claire McCaskill (D-MO); its report is entitled “Sudden Price Spikes in Off-Patent Prescription Drugs: The Monopoly Business Model that Harms Patients, Tax Payers and the U.S. Health Care System” (“Senate Report”). The Senate Report focused on dramatic price increases by four pharmaceutical companies1 in previously affordable prescription drugs whose patents had long expired. The business model used by all four companies was the same. In sum, each company identified and acquired an off-patent drug produced by only one company (a sole-source drug). The drug was considered the best drug available to treat a specific condition and served a small market so it was unlikely to invite competition and engender effective opposition to a price hike. The companies also chose drugs with a closed distribution system or obtained through a specialty pharmacy — that is, the company controlled access to the drug because it could not be obtained through normal channels. Finally, the companies raised prices as high as possible without investing anything in research or development, production or distribution.2 The business model was not unlike a hedge fund seeking to make as much profit as possible, and in many instances, was headed by management who had no pharmaceutical background. The Senate Report observed that the dramatic increase in the price of certain prescription drugs posed a threat to the “economic stability of American households,” affected the drug’s coverage by insurance plans, deprived ill patients of life-affecting drugs, undermined hospitals’ economic health and burdened the federal budget. The 2016 Symposium expanded the discussion of the points raised by the Senate report and discussed the anti-trust issues and case-law on the topic. ¹ Turing Pharmaceuticals, Retrophin, Inc., Valiant Pharmaceuticals Int’l, Inc. and Rodelis Therapeutics. ²Turing raised the price of Daraprim, a drug that treats toxoplasmosis, from $13.50 a pill to $750 a pill. Retrophin raised the price of Thiola, a drug that treats cystinuria, from $1.50 a tablet to $30. Rodelis raised the price of seromycin, a drug that treats drug-resistant tuberculosis, from $500 to $10,800. Valeant raised the price of syprine, a drug that treats Wilson disease, from $445 to $26,189; and raised the price of isuprel from $2,183 to $17,901.12 and nitropress, from $2148.30 to $8,808.80, two drugs used in hospital emergency rooms. On December 21, 2017, before the President signed the Tax Cuts and Jobs Act, ASCO released a statement setting forth its concerns for future cancer care. The text of the release, entitled Congress Must Act to Avoid Harmful Medicare Cuts in Tax Bill was authored by ASCO President Bruce E. Johnson, M.D.. FASCO. The text follows. “With the Tax Cuts and Jobs Act on the verge of being signed into law, the American Society of Clinical Oncology (ASCO) is concerned about across-the-board cuts to Medicare that the measure will trigger. We urge Congress to protect Medicare beneficiaries with cancer and other medical conditions by passing additional legislation to avoid cuts to the program. “Existing law requires automatic cuts to mandatory programs when the federal deficit is increased. The legislation Congress passed yesterday will trigger an estimated $25 billion cut to Medicare in 2018 unless Congress passes a waiver. Given that 60 percent of cancer patients in the United States are Medicare beneficiaries, a cut of this magnitude will cause further instability in the already fragile cancer care delivery system and threaten patient access to life-extending cancer care. “Since sequestration took effect in 2013, a growing number of oncology practices-particularly small and rural practices-have expressed concerns over growing financial burdens and sustainability of the essential services they provide to patients. Additional, and larger, Medicare cuts which are now looming in 2018, could force these practices to close their doors or consolidate, which will reduce patient access to cancer care.